Above left: habenero margarita with spicy salt. Above right: traditional lime margarita. At Barrio Chino many nights ago, with my dear friend Kris. 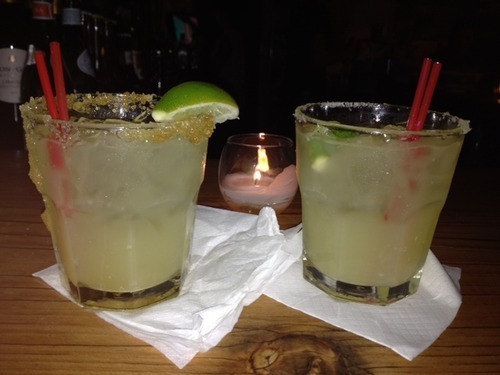 Because you should never drink on an empty stomach, below are two of my favorite Manhattan restaurants that just happen to serve some of the city’s best margaritas. Grab a seat at the bar and share the Plato Mexicano with a friend while you people watch. If you like a little spice in your life, try the habanero margarita. If you prefer sweet to spicy, then order the hibiscus flavored one. You can never go wrong with a spicy guacamole for two (prepared tableside) and the mole enchiladas. Order the restaurant’s signature, slushy, frozen pomegranate margarita and you’ll giggle your way right through a delicious meal. Salud to a fun night!